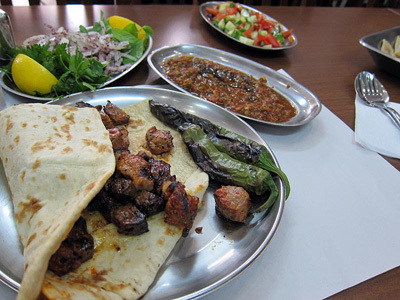 Near the Aksaray metro station, set back from a loveless part of Istanbul crossed by wide roads and overpasses, the kebab is flourishing. Over the past few decades, waves of migration have brought a particularly southeast Anatolian flavor to the otherwise drab apartment blocks and government buildings of this part of the Fatih district. Now bright isot peppers are strung up, handwritten signs in Arabic advertise services in barbershop windows, a nargile café is filled with older men smoking and playing cards. Nowhere else in the city is there such a high density of kebab restaurants and most of them are run by families from the southeastern city of Urfa. “This is an area that all Urfalı people come to. The more Urfalı people, the more kebab makers there will be, quite naturally,” said Bedih Zaman, a third-generation kebapçı and the proprietor, with his father, Babo, of Babo’nun Yeri. One of more than 20 kebab restaurants on the same block, Babo’nun Yeri has that certain combination of size (small), décor (Anatolian kitsch) and smells (puffs of hypnotizing grill smoke) vented out onto the sidewalk that we look for in a restaurant. And unlike nearly all of its neighbors, Babo doesn’t stand outside begging for customers – they come to him. Read the rest of the review at our new site, Culinary Backstreets.